﻿﻿Spreading across Texas’ fields, little bluets beckon for a closer look. ﻿﻿As winter fades, longer days and warmer soil temperatures encourage the emergence of tiny bluets. These compelling little wildflowers first caught my attention as a college student at Stephen F. Austin State University, where they blanketed the campus, urban lawns and city parks each spring. 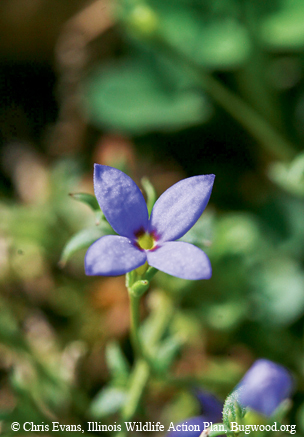 The bluet (Houstonia spp.) is a member of the madder family (Rubiaceae) and a delightful surprise of spring. Texas is blessed with seven of the 20 North American species of these showy little annuals. The bountiful sea of blue immediately drew me in. When I knelt down for an up-close look at the tiny flowers and foliage, I needed to get even closer, so I had to shift into an army-style crawl to really observe their charm. Bluets most notably occur in central, north-central, eastern and coastal Texas, where they flower from February through April. Bluets start out in singles and then form clumps, seeking openings in lawns and sparsely vegetated areas in early spring before grasses grow tall enough to shade them. Southern bluet (Houstonia micrantha), tiny bluet (Houstonia pusilla) and rose bluet (Houstonia rosea) are the three most common bluets in Texas. A robust rose bluet can attain a height of one inch. Flower colors include blue, purple, violet, pink and white. The blossoms have four sepals; the fruit is a heart-shaped, many-seeded capsule. Bees and other insects visit these sweet-smelling blooms for nectar. Medicinal uses include the treatment of head lice and gout, and they’re brewed as a tea to strengthen the bladder. Most often, bluets form a population with one color shade, but sometimes two species like the southern bluet and tiny bluet form a blue-and-white quilt across the landscape. The southern bluet and tiny bluet are frequently found in pastures, old fields, roadsides and lawns. The rose bluet occurs primarily in glade habitats such as sandstone and saline barrens, but can also be found in slightly disturbed areas. Bluets are found in most state parks in the eastern half of Texas: Atlanta, Bastrop, Brazos Bend, Cooper Lake, Daingerfield, Cedar Hill, Enchanted Rock, Fort Parker, Huntsville, Inks Lake, McKinney Falls, Pedernales Falls, Village Creek and others. Bluets are a lovely example of Texas micro-flora — just remember to squat down to fully appreciate their beauty.